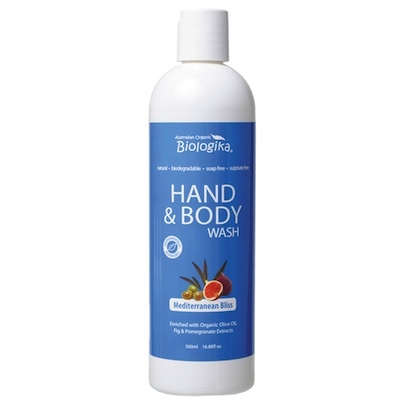 Hand & Body Wash Therapy range, Enriched with Organic Olive Oil, Fig & Pomegranate Extracts. Available in 1lt, 500ml and 250ml with pump. Organic Olive Oil a miraculous fruit that will protect your skin day in and day out, used as part of the Mediterranean culture for centuries not only as a culinary food, but also as an essential ingredient that it is easily absorbed by the skin and it has protecting and smoothing effect helping in retaining its natural elasticity. - Organic Fig extract assists in reducing cell built up on the surface of the skin, leaving it refreshed and renewed. Organic Pomegranate known to contain a powerful Ellagic acid, an extremely effective free radical scavenger, full of antioxidant with healing and anti-inflammatory properties. A gentle formula for everyone to Enjoy!! Ingredients: purified water, organic olive oil, decyl glucoside, organic aloe vera extract, organic fig extract, organic pomegranate extract, xanthan gum, almond oil, jasmine infused pure essential oil, vanilla absolute oil, organic mandarin red oil, Ylang Ylang essential oil, lime essential oil, olive leaf extract, potassium sorbate and citrus seed extract.